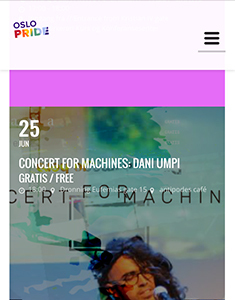 The second of four concert for machines arranged by antipodes café during 2016, was performed by Dani Umpi in a parade starting from Sukkerbiten towards antipodes café DEG15. During the concert, Dani presented new songs from the upcoming album Lechiguana. “In the beginning there was performance, and then everything else. This principle not only applies to 20th century avant-garde performers, but also to promiscuous, pagan symbolists like Dani Umpi. In a rare synthesis, Dani Umpi engenders characters with an approach analogous to Cindy Sherman, explores the conceptual-sensorial participation of the audience in the vein of Lygia Clark, while scrutinizing the mainstream, folk, and avant-garde world in a manner akin to Helio Oiticica. Dani’s world is a Tropical Neo-Concrete repertoire amalgamated by a glitzy conceptualist. Dani is not only a popular iconographer, but also aspires to become a “mainstream experimentalist”, an oxymoronic, genetic crossover between Yoko Ono, and Cris Morena. Dani’s work encompases collage, cabaret, music, literature, and visual art which modulate between the culture industry, and popular culture. The manufacture of a popstar persona has enable Umpi to compose songs, while melodramatic procedures sets a framework under which he writes novels akin to the works of Manuel Puig, and Hebe Uhart. Dani’s poetic sensibilities have enable him to style paintings, and installations out of paper which become interwoven on stage through a kaleidoscopic turmoil to form his onstage costumes, and scenography. His books, which serve as the basis of his songs, deal with subject matters such as love, friendship, and the ridicule. Dani Umpi overflows with pop-culture references, geometric motifs, archetypes, and esoteric symbolism. Dani’s process deconstructs the ideological discourse while replacing it with chromatic scales, and random speech patterns. Born in Tacuarembó, Uruguay, 1974. 2010 Como eu quero Hágalo Usted Mismo, Itinerant BBQ, Montevideo, Uruguay (1 shot) By Felipe Ridao for sonidoambiente TV, Argentina.